The white-tailed deer (Odocoileus virginianus), also known as the Virginia deer or simply as the whitetail, is a medium-sized deer native to the United States, Canada, Mexico, Central America, and South America as far south as Peru. The deer's coat is a reddish-brown in the spring and summer and turns to a grey-brown throughout the fall and winter. The deer can be recognized by the characteristic white underside to its tail, which it shows as a signal of alarm by raising the tail during escape. This piece was co-authored by Rockwell Schwartz, recent graduate of Vassar College's Science, Technology, & Society program. A shooting is happening right now at Vassar College. It is the fourth the campus has seen in the past six years. Over 115 have already been killed, their blood spilled on the college fields. Yet, it's unlikely you've heard anything about it. The national media remains silent; not even the local news has covered the grieving families or lost friends. No candlelight vigils, no memorials, no communal mourning, as the victims remain unidentified and seemingly forgotten. What's happening at Vassar College should be shocking, but similar shootings have been largely ignored across the country. The annual death toll climbs well into the millions, yet there is no accurate record of the casualties. Why? Because the victims were born as members of the wrong species. In the brewing national discussion on gun violence, the most numerous victims--animals--are left out of the conversation. For every human life taken by a gun, hundreds, if not thousands, of nonhuman lives have also been taken. Yet for these victims, gun control advocates not only erase their deaths, but also actively promote and protect the killings. We fail to label the unnecessary killing of animals as gun violence, and instead we euphemize and romanticize it as "sportsmanship." But hunting is gun violence. A bullet ripping through flesh, puncturing arteries, taking a life is violence no matter the victim's species. And these deaths are far from as clean and easy as often presented: One study found that more than 1 in 10 deer died only after two or more shots, often suffering for over 15 minutes prior to death. White Buffalo, Inc.--an organization hired by Vassar College to conduct killings on its campus--became the subject of a lawsuit following undercover footage collected at one of its shoots. In one video, a mother deer is shot in the head right in front of her two fawns and she is seen still kicking as a park ranger places a plastic bag over her head. Even when hunting is carried out by paid professionals, there is still suffering and a surge of cortisol-driven terror. One obstacle to seeing nonhumans as victims of gun violence is our tendency to reduce them to an anonymous collective. 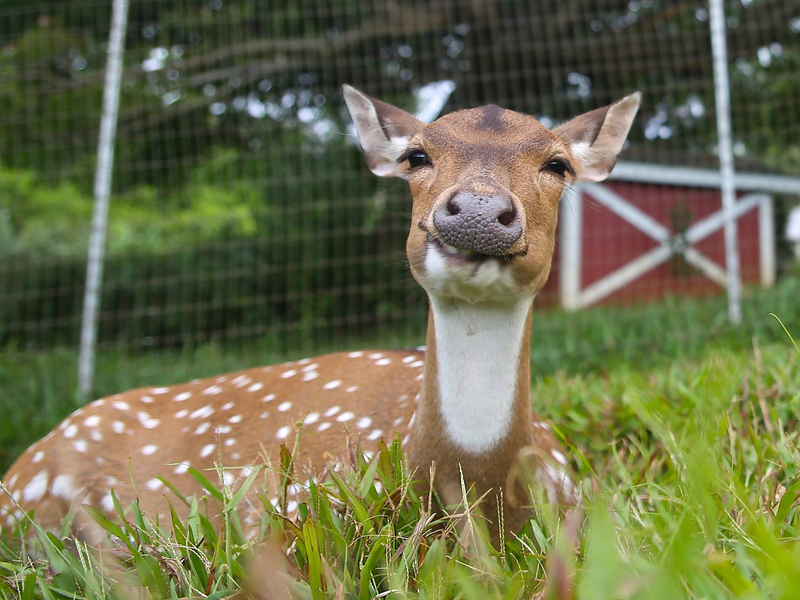 Victims matter more to us when we can see them as individuals, such as the rescued animals of Leilani Farm Sanctuary of Maui. We connect to the animals there as individuals because we know their stories. Particularly compelling is the relationship between Veronica the deer and Berney the wild boar. Veronica was rescued after hunters shot her mother in front of her when she was just a fawn. Berney wandered onto the sanctuary as a piglet, clearly also orphaned and searching for safety. Today, these two individuals, both members of commonly hunted species, live in safety. The sanctuary shares anecdotes of Veronica teasing Berney out of jealousy and Berney running over when his name is called. Once we see Veronica and Berney as unique individuals with their own personalities, interests, relationships, and needs, it becomes clear that shooting them would be an act of violence. At some level, most of us understand that killing animals is wrong. Nobody feels good about telling a child that hunters shot Bambi's mom. Even staunch hunting advocates will describe it as a necessary evil. Conversely, the public is captivated by stories of hunters saving the animals they had intended to kill. We love to watch the once-villain put his own safety on the line to help an animal in need. We care about these animals and sympathize with their suffering so much that a video posted last month of one doe's rescue has already garnered over a million views. Understanding their deaths as gun violence--and including their interests in the national conversation--is the logical conclusion. Following the statements of President Obama, who speaks of his respect for hunters, 2016's three Democratic hopefuls have paradoxically condemned gun violence while ensuring that gun violence against animals continues undisturbed. This week, Bernie Sanders emphasized that his support for gun safety legislation would "not negatively impact" the hunting community. Hillary Clinton has also noted her "respect" for hunters, and whitewashed the killing of animals simply as "part of a way of life." Meanwhile, Martin O'Malley has notoriously overseen the controversial Maryland black bear trophy hunt. He touts Maryland's "comprehensive" gun safety legislation for not interrupting "a single person's hunting season," while he criticizes the records of both Sanders and Clinton as inconsistent on gun violence. In the end, it seems all three Democratic candidates, as well as President Obama, are pandering to conservative hunting advocates (and selling out the animals) to market a more palatable plan to stop gun violence against human beings. We ought to demand more of progressive politicians. The majority of Americans believe that hunting animals is wrong. We must demand that they stop using animals' lives as bargaining chips to appear moderate or reasonable on gun control. There is absolutely nothing to "respect" about the unnecessary killing of animals. There is nothing wholesome about shooting individuals who want to be free from harm. Hunting is gun violence, and it's time we start acting like it.